The official cause of this crash is a disabled control panel and a driver who black out. Federal investigators said Thursday that the driver of a San Francisco Muni train that crashed and injured dozens of passengers had blacked out just after switching off the controls designed to stop the train automatically. The San Francisco Municipal Railway Transit System contributed to the crash by not enforcing a rule against switching off the controls before trains reached the station platform, according to the National Transportation Safety Board's final report on the July 2009 crash. The Muni train was traveling at more than 20 mph when it struck another train stopped in the West Portal station, according to the report. The crash injured 46 passengers and the operators of both trains. Automatic braking controls stopped the incoming train before it entered the station, but the driver switched them off and began manually moving the train to the platform when he lost conscious, according to the report. The moving train then slammed into the rear of the second train already stopped at the platform. The driver told investigators that switching off the automatic braking controls before entering the station was "a normal thing that we usually do." All drivers are required to get permission from Muni's control center before disengaging the automatic braking system, according to the report. But workers at the control center told investigators that drivers routinely do not seek permission to cut out the braking control before entering West Portal, a move that the driver of the stopped train agreed was an easier way to bring it to the platform. 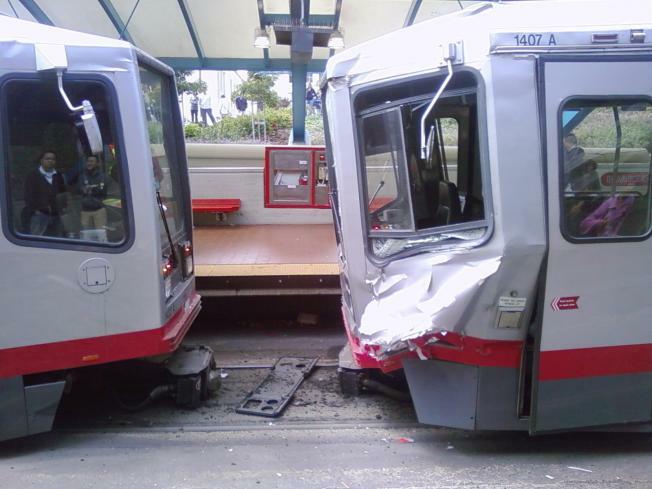 Two days after the accident, Muni warned drivers that failure to ask permission to disengage the automatic brakes could get them fired. "The investigation by the NTSB is in line with our findings," said Muni spokesman Paul Rose. "Immediately following the incident in 2009, we took steps to insure this doesn't happen again." Control center workers who observe drivers disabling the automatic system without asking permission will order the trains to stop immediately, Rose said. The number of incidents of drivers disabling the system dropped from about 2,000 times per month before the crash to about eight times per month since the crash, he said. Doctors determined that a narrowed heart valve was the cause of the driver's blackout, the report said. given a five-day suspension for that crash.